Lately I've been on the hunt for a new Blazer or two. I don't have but two, so I obviously could use more right?! These are a few I've eyeing. I wish they could all live with me! I think the Teal and the Cream below it are my favorites....must make some decisions!!! I'm addicted to blazers, I have way too many for someone who works in a pretty casual work environment. Teal is def my fave! I LOVE that teal one!! I've been on the same hunt, which is strange because summer is almost here! Have you seen the leather Helmut Lang blazer around the blogisphere? It's amamzing! YES LOVE!!!! But sadly a lot of my favorites are out of my budget! But I dream! I love a good blazer, but my favorites are wool, so I've had to put them away. 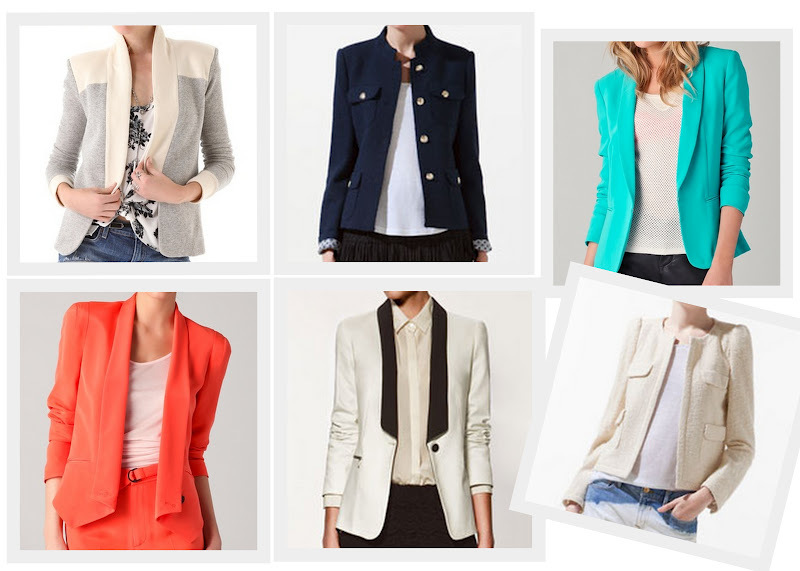 I've been on the lookout for bright, summer friendly blazers lately. I tried on an orange blazer at Madewell last week that was great. I'm kicking myself for not getting it. Definitely check out their selection too. I'm thinking I really need that cream Zara one. It's so girly and pretty! i purchased that zara tuxedo blazer & my husband told me I looked like a waiter at a nice resto so back it went, I think a blazer is a staple to any wardrobe& can make a simple outfit more polished instantly. I tend to go for the classic navy or black, but i love the tuxedo blazers in the colors & I recently bought a bright orange boucle that has been fun to wear! I recently bought a military style one from The Loft s d I love it ! Looks similar to the navy Zara one! That Chanel look alike is amazing!!!!! I reeeeeeeally love the last one! This is the second post about blazers I've seen this week! So in love with blazers and jackets of all sorts. You can never have enough! That navy one is KILLER! I love blazers!The black&white one is my favourite!